Abby’s Road paperback is available at Amazon! It’s the story of my wife and my experiences with infertility treatment and the legal and emotional red tape of adoption. SPOILER: it ends happily! Abby’s Road available as a Nook book! What way to celebrate my 100th post!! Good news! 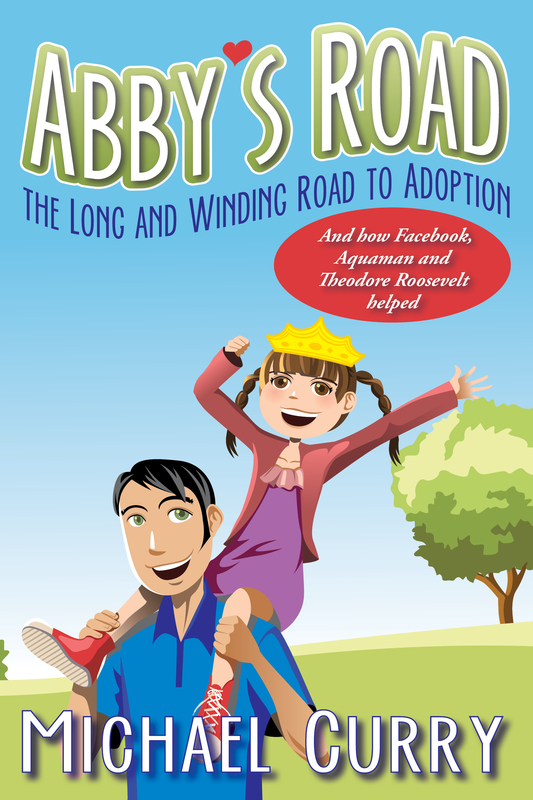 My book, “Abby’s Road, the Long and Winding Road to Adoption, and How Facebook, Aquaman and Theodore Roosevelt Helped!” is now available for your Nook at Barnes & Noble! Hoo-rah!! My story so far: my doctor told me start getting serious about lowering my blood sugar. I took her advice and read the book she recommended, the book my wife preferred and a third book that combined the two. I finished the cookies, Cheetos and bread in the house (I didn’t want to be wasteful – teehee) and started in on the regime. The first thing I did was quit eating anything with enriched flour and high-fructose corn syrup. At first I ate nothing that had ingredients ending in “-ose”. This meant sugar. I learned that some “-oses” are okay, though. Cheeses have cellulose that helps them from becoming runny over time. The body does not absorb this and is safe to eat – plus the cheeses give you the protein and fat required in these diabetic diets. For many months I sprinkled flaxseed on my salads and soups to help me sleep (don’t ask, that is an entirely other subject). So I found a recipe to make bread using flaxseed meal. My first try at baking bread was awful – I didn’t use enough baking powder and DID use too much liquids. My second try made for some very tasty bread! Ugly bread, true – it was so dark it was almost purple; but tasty! That helped my bread cravings and helped avoid enriched flour – which even the “good for you” wheat bread has! I will probably have to go to a real health-food store to find un-enriched bread. By now my wife was helping me review labels and nutritional information. We learned most mayonnaise doesn’t have a lot of sugar in it anyway and there are lots of brands available with low sugar-content regardless. They also cost a lot cheaper than the individual ingredients of home-made mayo. Well, that’s okay, I used my homemade mayo/Miracle Whip combo tuna and ham salad – the food processor is wonderful to chop up the ham and other lunch meats into salads. Bologna salad mixed with some chicken and turkey is actually pretty good, if you include olives, onions and other flavors! All the added protein helped balance the sugars in the salad dressing. And I nibble through the day instead of three meals. I eat light in the morning (usually one of the glucose-free drinks suggested by The Diabetes Break-Through) and about 10:30 eat a “breakfast bar” also suggested by the book. Then a small lunch at 1:30 – usually tuna and mayonnaise mixed together and a small snack at 5:00 and then another at 7:30 or 8:00. This has changed to a larger meal at 5:30 that I must finish by 6:00 to keep my evening blood sugar low. With the change in diet came a change in medication, or at least a change in how I take my meds. My doctor advised me to take my metformin just before I eat dinner for best effect. She also prescribed Landus – which requires evening shots. I don’t like the shots but I do them. And now I also walk. At first I did one time around the block. Then two. Then five. Coincidentally I found five times around the block was about one mile! So I was doing a mile a day. My tennis shoes were falling apart (cheap Wal-Mart things) so I bought a nicer pair at a real shoe store and then one mile in the morning and one mile in the evening. I’ve added a city block so now my regular route is 1.7 miles per walk. I manage two walking sessions about every other day – and on weekends three jaunts – but always manage at least one walk even on busy days. At night I put weights on my ankles and wrists. I sweat up a storm and I can feel my heart pound during that last mile (not in a bad way), so I know I am frothing up my metabolism. I’ve changed my route lately to take me closer to downtown. The sidewalks are better, there is more traffic (I walk past the police station and some businesses) and that makes me more self-conscious about walking; but there are less dogs snarling at me. Sometimes my belly raises havok at the bigger meal before 6:00 followed by a brisk walk. I can feel the food sitting and roiling in my tummy. Ick. I know it’s not doing me any good. Has it worked? When I started measuring my blood sugar and eating, cooking and walking like I was supposed to do in early May my blood sugar was 210-225 morning and evening. After three weeks my morning blood sugar was below 100. Evening measurements were still high – around 140. But walking in the evening and no eating after 6:00 has lowered it to below the normal-120. A few days ago my “at bed” reading was 89! Imagine my surprise when I broke down and bought two double cheeseburgers from Hardees for lunch, but by the time I took my blood sugar that night it was normal. I think it all goes back to balance. The cheeseburgers had plenty of enriched flour, fat and sugar; but also protein. And I ate well the rest of the day and walked. I still had a devil of a time getting my blood sugar down in the evening. Then I stopped eating after six. Insulin-Resistance says 8:00pm, but that wasn’t working. 6:00 did the trick. And if I can resist snacking late at night my mornings are lower too. It was hard those first few days. I felt so awful and hungry by 11:00 I had only three grapes or a spoonful of peanut butter. That shot my morning blood sugar into the 120s. That’s happened three times now. “Chronic Somogyi rebound is a contested explanation of phenomena of elevated blood sugars in the morning. Also called the Somogyi effect and posthypoglycemic hyperglycemia, it is a rebounding high blood sugar that is a response to low blood sugar. When managing the blood glucose level with insulin injections, this effect is counter-intuitive to insulin users who experience high blood sugar in the morning as a result of an overabundance of insulin at night. “This theoretical phenomenon was named after Dr. Michael Somogyi, a Hungarian-born professor of biochemistry at the Washington University and Jewish Hospital of St. Louis, who prepared the first insulin treatment given to a child with diabetes in the USA in October 1922. Somogyi showed that excessive insulin makes diabetes unstable and first published his findings in 1938. That’s pretty close, I fear. My wife suggests keeping a jar of peanuts next to the bed. When I feel woozie (I could barely stand during a midnight pee due to my head spinning), I’ll munch on a few peanuts. I found some roasted edamame at the Dierburgs in O’Fallon, Illinois. It is nothing but protein and doesn’t affect my blood sugar in the mornings when I eat them even at midnight. A small box of raisins helps too. I have lost about ten pounds so far, but I’m not really feeling any better. In fact, when my blood sugar is low I feel pretty crappy. Hopefully I will feel better in the long term. If I continue on my course and my blood sugar stays down, and I continue to lose weight; things will look up. Diabolic: the Greek diabolos (devil; diavolos; διάβολος) from the verb diaballo (to insinuate things (against someone), put someone in a bad light, slander, calumniate; from dia- “across, through” +ballo “to throw”. My doctor said I had to get my blood sugar down from the 300s to normal levels. It would affect my kidneys, eyes and other organs as I slogged my way through my 50s. My doctor recommended Sugar Busters (or The New Sugar Busters! Cut Sugar to Trim Fat) by H Leighton Steward, Morrison C Bethea, Sam S Andrews & Luis A Balart, ISBN 0-345-45537-1 by Ballentine, 2003. Since my wife works at a library, it is fairly easy for me to get and read such things. It starts with explaining refined sugars and enriched flour and how bad such things are for us – and strictly eliminates them. My wife refers to the book as “Sugar Nazis” and I agree. But I am also an all-or-nothing sort of person and I need such absolutes. At least for now. No white bread. No bread at all if I can do it. In later chapters it compares itself to other “diet plans” – if only to avoid copyright infringement. And it spends some time on the famous Atkins Diet. I find the differences between the two small. Atkins says no carbs, Sugar Busters says carbs in moderation and “good” carbs – the aforesaid brown rice and whole wheat. What helps for the rest of you is that the “diet” doesn’t concern itself just with diabetes, but childhood obesity and women’s weight issues. This plan can be done by the whole family. That’s because it is chocked full of recipes. It tells you what kinds of food to stock (whole wheat flour, veggies, fruits) and what to throw out – white flour, sugar, etc. And then it includes lots of recipes – including recipes from famous restaurants and chefs from across the country. I especially like the fresh spinach salad with bacon. I add a bit of Dijon mustard to the vinaigrette. Yummy. 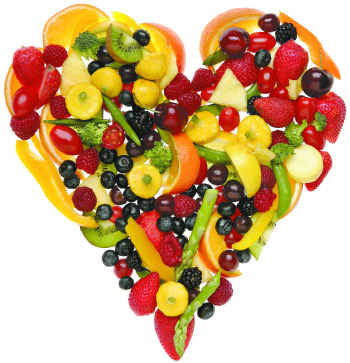 An interesting takeaway is this: eating fruit 30 minutes before a meal helps with the fruit’s digestion. It’s filled with good tidbits like that. My wife recommended The Insulin-Resistance Diet by Cheryle F Hart & Mary Kay Grossman, ISBN 978-0-07-149984-2 by McGraw-Hill, 2008. She thought it was less intense than the “Sugar Nazis”. And it is. It’s a book for the rest of us who do not have the willpower to cut off our beloved bread and sweets entirely. I needed the intensity to get my blood sugar down. But once down – or as down as a diabetic can be – how to I keep it down even when I am bad? And I know I will be bad. After a week or so of “boot camp” – I wanna pizza and a Snickers bar. This book’s mantra is balance. Balance is the key. The call it the Link and Balance See Saw. I see it more as an apothecary scale. Neutral foods – veggies, etc. – in the middle, with carbs and proteins on either end. If the meal or things you are eating are balanced – it’s good for you. 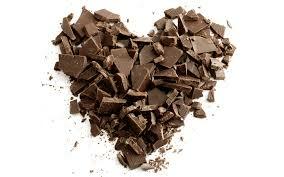 It provides an extensive list of foods by category – carbs, proteins and neutral. It even includes commercial products – name brand cereals and fast food entrées! Balancing carbs to protein is about 2 to 1, slightly more to the carbs (2.14 to 1 from some of their examples – I keep it at 2 to 1). If a product has, say, 18g of carbs, but also has 9g of protein – this is balanced and good for you. On weekends I enjoy instant (plain) oatmeal with some cinnamon and Splenda in it. With this balance system – I also cook two slices of bacon or sausage patties for the protein and eat that with the oatmeal. Any excuse to eat bacon. This has really gotten me looking at the nutritional labels on foods. Especially fast foods. Look at a Subway sandwich – I get the flatbread with tuna with plenty of veggies, mayo, hot sauce and pepper jack cheese. 40g carbs (yow!) minus 2g fiber (see Diabetes Breakthrough) balanced with 20g protein. Balanced. It also includes lots of recipes as well as how to Link and Balance with commercial products like Hamburger Helper. The section on what to look for in menu items in specific types of restaurants is interesting too (Chinese, Mexican, Italian, etc.). And no eating just before bed. Cholesterol collects when you sleep. If you go to bed with a full tummy, it can raise your cholesterol. This was always a problem for me. The book has testimonials or life-stories, which I ignore. “Remember Susan, the receptionist from the beginning of this Chapter?” No, and I could care less. A better book than Sugar Busters for later use; less militant and more techy and number-crunchy, which is fun! That’s not to say Busters is not a good book, it is! It’s what I needed for the first month or so, Insulin Resistance is what I can use afterward to keep my blood sugar under control after the Busters boot camp lowered it to normal levels. And speaking of boot camp, this brings us to The Diabetes Break-Through by Osama Hamdy & Sheri R Colberg, ISBN13:978-0-373-89284-6, Harvard Health Publications/Harlequin Health, 2013. This is a very regimented and controlled eating plan. It tells you what to eat and when (and how) to exercise. Like Sugar Busters, someone who needs the discipline and has the willpower and self-control to follow it to the letter will benefit by this book. The menus are not draconian and suggest the same foods as the other two books. You may eat a tablespoon of peanut butter on a slice of whole wheat bread, for example. The book explains measurements in general terms – a cup is about the size of your fist, my thumb a tablespoon and my thumb’s tip a teaspoon. That was my favorite bit taken from the book. I like that it lists specific diabetic-friendly meal-replacement shakes and frozen dinners. The next day I was putting them in my grocery cart and have been dining on them ever since. Here I learned that my glypizide can sometimes cause weight gain. Hmm. Not as many recipes as the other two books, but plenty of exercise instructions and illustrations – much more so than the previous two books. The layout is very strict and militant – which are not words I would use to describe the diet itself. Fortunately I am past the first month of getting my blood sugar down to manageable levels, so I do not need the strict instructions of the first few weeks. As with Insulin Resistance, anyone who loves techy number-crunching will like the structure of the book – if not the diet itself! It mentions a way to look at the nutrition chart that the others do not. You subtract dietary fiber from the total carbs – they don’t really count as carbs. You can also subtract one-half of the sugar alcohol from the total carbs, too. Look at the Atkins’ Peanut Butter Granola Bar (which I eat for breakfast on hectic week-days) – 18g carbs, but 5g is fiber and 11g is sugar alcohol. This makes the bar, according to this book, effectively only 8g of carbs. Considering its 15g of protein, this is REALLY good for me according to the Insulin Resistance Link and Balance See Saw. Why does no one else mention this? A web search seems to confirm this idea of net carbs – WebMD has a nice page about it. They warn to be careful of such labels as “net carbs” though. So I use all three books – their recommendations for food, eating out, checking the labels, buying groceries, etc. The books share common ground but are unique enough to get something out of each of them. Somewhere among the three lie the truth, I think. I just have to ignore the individual hype. Let’s talk about my fight with diabetes. Here’s how it came about. The next few pages are excerpted and edited for content from my upcoming book, Abby’s Road; the Long and Winding Road to Adoption, and How Facebook, Aquaman and Theodore Roosevelt Helped available at i-tunes and next week at Barnes & Noble for your Nook. It will be available for Kindle and as a paperback by August 1st. Both my grandmothers had diabetes and my mother was probably on the cusp of it in the years before she died. So I was a good candidate. I was diagnosed with diabetes while my wife and I were trying to have a child through infertility treatments. We were not having much luck with the intrauterine inseminations and the in-vitro fertilizations, so my wife and I both had our tunnels checked, if you know what I mean. She had fibroids, which out-patient surgery resolved. I had some blockage in my passageways, too. Not enough to be dangerous, but enough to affect the amount and quality of sperm getting through. Clearing this up would help my sperm count and their motility. The more unweary the soldiers, the better chance the fertilized eggs would develop and grow. Then the IVF would “take”. I didn’t like the idea of surgery, but if Esther could do it, I could too. But Nurse Ratchet was unmovable. So, I have to lower my blood sugar to have the operation to clear out the tunnels to allow more active sperm to end up in the cup to be washed and inseminated into my wife so that we may have a litter of kids. OK, fine. I’ll do it. Esther’s blood doctor is near Carbondale, a university town in southern Illinois. We made an appointment with him and I was again poked, pricked and prodded. I had diabetes. All those years of savoring M&Ms had come home to roost. I don’t do shots; I cannot do shots. I couldn’t give Esther her shots and I certainly wasn’t going to give myself shots. Fortunately, my new doctor said, my diabetes could be controlled with pills. Pills? Pills I can do. As long as there are no shots involved, I could take enough pills to choke Elvis. And I was given enough pills to do just that. Metformin and Glipizide for the blood sugar, but those would raise my cholesterol; so another prescription to lower my cholesterol. Plus an aspirin regimen to thin the blood – blood clots may become an issue. Plus, I still took the vitamins and supplements from the beginning of this quest. Then came the diet. My beloved M&Ms were out. So were raisins. We cut back on anything with enriched flour (white bread). This I didn’t mind. I like my bread dark. Really dark. So dark it absorbs the light from the refrigerator (and I always keep bread in the refrigerator…). But even then very little bread. I can still eat my fish and chicken slathered in hot sauce – just not as a sandwich. I can accept that. Most pasta was out – spaghetti, ziti, lo mein, SpaghettiOs. No. Absolutely not. I may go blind, I may lose all feeling in my feet, the hair may drop off my legs, but I will not abandon that neat round spaghetti you can eat with a spoon. I will not let go of my childhood friend. I ate a can a day as a youngster; well, it seemed like it. So O’s once every few weeks as a snack. Weeks later I realized I had not eaten any at all. If they had not mentioned pasta, I probably would not have noticed I hardly ate O’s anymore. I guess it was the principle – wanting to have some kind of control or to be able to rebel at some part of this process. Peanut butter was okay (in moderation) and nuts were fine, too. I went to a free dietary class for diabetics at the hospital. Unfortunately I was the only one there. Ick, I was hoping to be a face in the crowd; now I am in for a one-on-one conversation. The fellow who taught the class was very nice and had plenty of visual aids – lots of plastic food. We discussed what was good to eat – “vegetables are free,’ he said. “Tell that to the security guard at the grocery store,” said I. “No, that means you can eat as many vegetables as you want…” said he. “…except potatoes and corn,” said he. I was missing the point of all this. A serving of meat? That’s a serving of meat? That’s a forkful of meat. I find bigger pieces of meat when I floss. I also got back on the treadmill. I had been using it off and on for years but I was determined to exhaust and sweat down my blood sugar. I hated it. I much prefer a brisk walk outside, but I would only have a short amount of time to walk in the evenings when I get home before bed. Plus I am not an outdoor guy. There is about a two-week window in the spring and fall when the weather is neither too hot nor too cold to run outside. And it would be embarrassing and humiliating, let’s be honest. I’m not exactly the athletic type. Neighbors would see me out there and laugh. I should know – I laugh at them. Old men would pass me, so would children on tricycles. No, best to keep my dignity by staying inside. I got up a half-hour earlier in the morning to go to the basement and … um … treaded. It did the trick – running in place while munching rabbit food, nibbling on the one serving of meat dangling off my fork and taking so many pills Judy Garland would be jealous – and my blood sugar was down from the six hundreds to double digits. But all things must pass… The Carbondale doctor stopped taking my insurance and I found another in Mount Vernon, where I live, who was a bit … um … lax. He would renew my medication but otherwise wouldn’t care too much. He has that reputation. Slowly sweets would creep back into my diet. I was eating a cookie or two just before bed. After a few years that doctor stopped taking my insurance, too. I had switched jobs and had different insurance – both sucked. Insurance coverage, not the job. I found yet another new doctor. She is very nice and I enjoy visiting: the place is clean, not crowded and I can get in quickly. But she put the fear of blood sugar back into me. I am turning 50 this year and, she said, if I don’t get my diabetes under control the next ten years will see my kidneys and other organs start to break down. I already admit to having not much feeling in my feet and have lost a lot of hair down there – a result of constricting blood vessels. More importantly, I now have a daughter I would like to see graduate high school. So I agreed. The new doctor renewed my medication – gave me instructions on when specifically to take them (my Metformin before I eat, not at bedtime, for example) and recommended I read a book. A book? Me read a book? Mwah-hah-hah! That’s one of my favorite activities. I can read a book with my eyes closed! Abby’s Road available as an ebook! 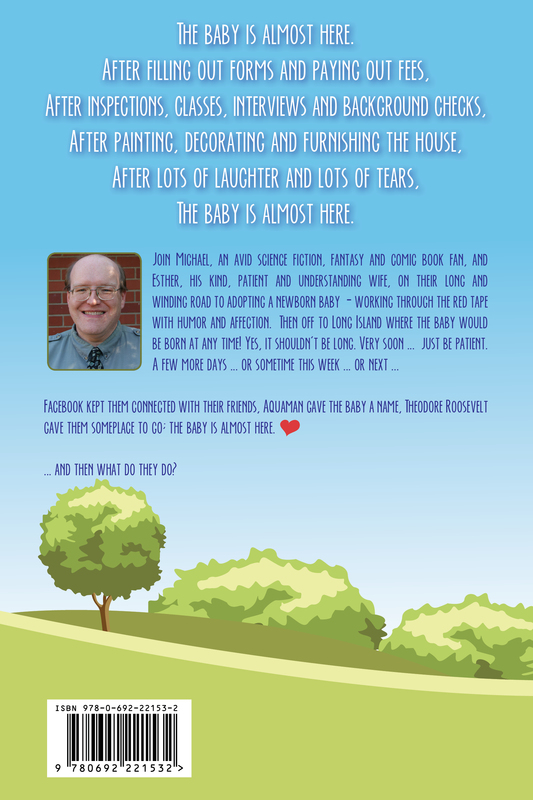 Abby’s Road, the Long and Winding Road to Adoption is now available as an ebook at the Smashwords store! Unfortunately, it will be 24 hours or so until it is available on Barnes & Noble and Apple books. Kindle and paperback through Amazon will still be a few weeks – although Smashwords DOES have a Kindle button … hmmm … In the meantime, download a sample and enjoy it while you wait for your preferred format! Thanks everyone for their encouragement and support. I hope you enjoy it! Abby’s Road leads a couple through their days of infertility treatments and adoption. It is told with gentle (and sometimes not-so-gentle) humor from the perspective of a nerdy father and his loving and understanding wife. Join Mike and Esther as they go through IUIs and IFVs, as they search for an adoption agency, are selected by a birth mother, prepare their house, prepare their family, prepare themselves and then wait for their daughter to be born a thousand miles from home. “Once upon a time, there was a mommy and a daddy who loved each other very much. And they wanted to have a baby of their very own, but they couldn’t even though they tried and they tried. “So they decided to adopt a baby. They talked to some very nice people who help mommies and daddies like them. “And they met a very nice man and woman named Valerie and David who were having a baby but couldn’t be the baby’s mommy and daddy. So they picked Mommy and Daddy to be their baby’s mommy and daddy. “So when it came time for the baby to be born, the mommy and daddy took a long plane ride to Long Island, New York where they waited and waited, and they waited and waited, and they waited and waited until finally the baby was born. “The next day they went to the hospital to see the baby, but they couldn’t hold her. They could only look at her through the nursery window lying in her teeny tiny little baby bed. But the day after that they got to go back. “They got to hold the baby. They got to dress the baby. They got to name the baby Abigail, put her in a car seat, put her in the car and take her back to the hotel where they were staying. Thanks everyone for their encouragement and support. I hope you enjoy it! Propositum by Sean P. Curley ISBN Paperback: 978-1-60047-762-1; Digital: 9781301786299 was released in 2007. I purchased it in 2013 but did not read it until summer of 2014. “If Jesus did not exist, then how did Christianity form? “Inside a rich landscape of the failing Roman Republic and a tumultuous Jewish population is an ambitious and visionary ex-Senator who conspires with Paul of Tarsus to create something… better. Propositum is a dramatization of the Christ Myth Theory. Proculus, a retired Senator living in Judea with his Jewish wife June, is the author of the theory. He believes the RomanRepublic is dying and very quickly turning into an empire. As such, they will be a danger to his beloved Judea – who, as a people, will not accept Rome (or anyone) as their despotic rulers. Eventually an Emperor will not tolerate the Jews being exempt from taxes every seven years; and with emperors proclaiming themselves and their kin gods … well, the whole “Thou shalt have no other gods before me” thing will make life in Judea a little awkward. Awkward is putting it mildly. Proculus believes the disputes will lead to outright war; a war that will not go well for Judea. How will he save his wife’s people? His friends? If he can spread Judaism through the empire- inculcate it so thoroughly that it supercedes the other religions – including the emperors’ self-created deities – that a war or conflict would be impossible. But how can that be done, Proculus thinks. The tenants of Judaism do not easily lend themselves to proselytizing. Dietary restrictions. Clothing restrictions. Laws about what to do and not to do on the Sabbath. Proculus sees the problem. Not only will he need to find a way to get permission to convert Gentiles (a big enough hurdle), but to allow the converted Gentiles to eschew some of the more draconian and undesirable rules of Judaism. The more desirable it is, the more converts there will be. The more converts there will be, the less likely a Roman Empire would desire a civil war. It may not restore the Republic, but it will save Judea from destruction because they wish to follow dogma. He enlists the aid of his friend Maximus, a retired general. With both their contacts still in Rome, they hope to be able to manipulate and cajole enough politicians and power brokers to allow them to continue to spread their new and improved version of Judaism. But neither of them would be taken seriously as ministers of this Jewish reboot. They need a more believable figurehead. Proculus’ friends in Tarus have a son named Saul. Saul spent most of his childhood preparing to study and become a Pharisee. Unfortunately, he flunked out. Fortunately, it instilled in him not a hatred, but a bitterness of all things Pharisaic. Saul recommends emulating the beliefs of the Essenes. Proculus assigns Saul to find out as much as he can about the sect and report back to him. Saul learns of the Teacher, who espoused what Proculus is planning one hundred years before. Saul jots down the sayings and beliefs of the Essenes and their Teacher in what he calls the Book of Q. Meanwhile, Emperor Tiberius dies and Proculus and Maximus go to Rome to suss out the two new possible emperors. They decide Caligula would be the less tolerant of the two and help manipulate his way to the throne. When Caligula becomes emperor, Proculus convinces him that, since he is a god, his likeness should be in every temple. Even Jewish temples. But that is strictly forbidden by the Jews. Caligula doesn’t care. Proculus is pleased. The threat of war with Rome will goad the higher Jewish counsels to approve Proculus’ plans to convert the Gentiles. Saul finds a perfect personification of their beliefs in John the Baptist and listens to him preach, but he is killed before Saul can actually meet him. They decide to make the Teacher a more modern figure rather than someone who died in the previous century. They name him Jesus – a common and untraceable name. Saul takes Proculus’ suggestion to change his name to Paul and his home from Tarus to Tarsus to avoid questions about his true past. 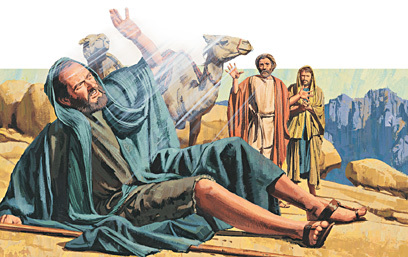 He finds others who embrace his beliefs – Silas, Barsabbas, James, Cephas also called Peter, and small, wiry John. Whole families are brought into the new religion. One baby, Theophorus, was the first generation to learn about the new way from the crib. I had to look him up on Wikipedia to discover who he was. A new emperor, Claudius, ascends the throne. He will be much more tolerant of the Jews. This will not do. By now Maximus and Proculus are joined by Maximus’ daughter Curia who keeps the leaders apprised of events in Rome. We read as she marries and has two children. The religion continues to grow. Paul writes epistles to the leaders and the communities that have established temples and churches. Proculus grows older, but more confident that his plan will succeed. A new emperor, Nero, ascends the throne. He will be much less tolerable of the Jews. Proculus visits him and is worried – perhaps he will go too far. The Pharisees start to push back. They allowed the conversions of the Gentiles, but not all of the changes to their sacrosanct laws. Paul and his followers are arrested. Some are killed. Paul adds details to the life of Jesus – he was killed by the Pharisees. This turns the crowds against their mockers and in their corner. More friends and followers are made; some friends and followers die. 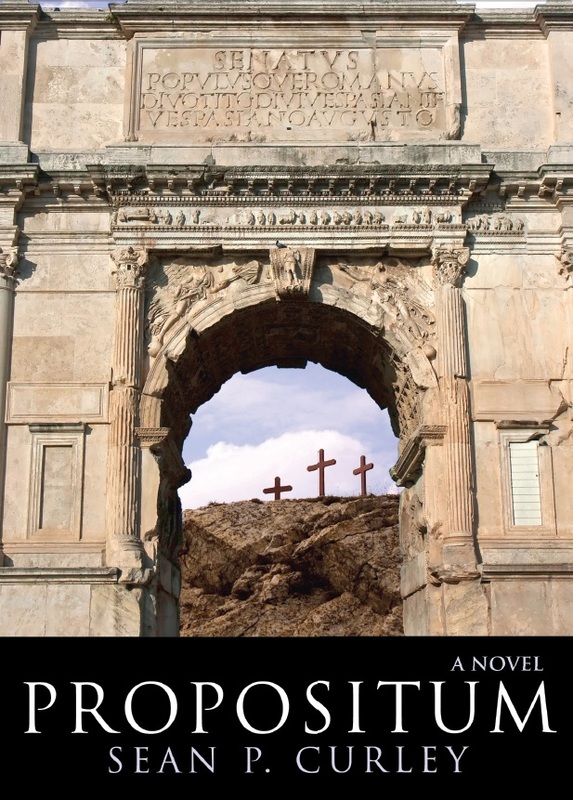 Propositum is a thoroughly researched and very entertaining historical novel. You get the feel of what life was like at the time – how someone from the era lived, what they ate, how they traveled, etc. In most respects the characters are realistic and likable. Yes, Proculus is a likeable fellow despite what he hath wrought. You want to dine with him and his wife. You admire Maximus’ strength and courage. You even root for Paul to succeed after his first faltering attempts at public speaking. The few action scenes are very well done and usually involve Maximus: his thwarting assassination attempts on the emperors, his leading troops during the sack of Jerusalem (including some wonderfully written spy work). But the book usually consists of meetings. Paul reports and updates Proculus and Maximus on the goings on in the soon-to-be Holy Land. Curia reports on the goings on in the Senate and the dealings of the Emperor. This leads to one of the flaws of the book. I’m the last person who should be critiquing a book – but Propositum sometimes suffers from the old writer’s trope “show – don’t tell”. The book has a LOT of “tells”. Paul discusses people he meets – friends and foes – his ideas to move the propositum forward. That sort of thing. The “shows” are done quite well – Paul’s first attempts at preaching, Maximus going with him on one journey and arranging a few miracles credited to Paul, Peter’s ministry and its results, Proculus’ meetings with Senators and Emperors, the aforesaid sacking of Jerusalem, the burning of Rome and its effect on the cast, Paul’s vision on the road to Damascus (side note – it was fun reading and second-guessing what the author decided “really” happened and who “really” existed – John the Baptist was a great example) . All well done. If the “tells” were turned into “shows” it would have doubled the length of the book. That would not be a bad thing – I would have loved to have spent more time in this world with these characters. Why not show us Paul in the crowd listening to John the Baptist and his thoughts about him rather than have us sit with Proculus as Paul tells us about hearing John minister? Do you see the difference? One great thing about the book is that during it all we still root for Proculus even thought some of his decisions cause some horrific results. He single-handedly caused strife between Rome under Caligula and Judea. He fomented anti-Jewish fervor during the Roman fire in the time of Nero. There were other, smaller, moments that I truly enjoyed. Paul’s misogyny was present from the beginning, and his growing dislike of Curia was fun to read. Curia’s growth from a reluctant participant to the head of the order was well done. My favorite moments involve Paul – his first poorly-done ministries, his growth as an apostle, the slow realization that he is a tool being manipulated and his inevitable acceptance that his usefulness is finally over. One review mildly critiques the book: “Nearly every plan is executed perfectly”. Although we are shown Paul’s tough time with his first attempts at ministering and we see some disastrous results with Paul and Peter against pro-Pharisee groups; that is true. Proculus’ manipulation of the Roman government and particularly the Emperors and wanna-be emperors would make the Illuminati and Bilderburg Group members jealous. The book spans 40 years. Perhaps this criticism could be avoided by showing us how long this timespan is. Perhaps Proculus is frustrated at times – he realizes he will not live to see his plan in complete fruition, but he can still regret it not going faster. Common history tells us Constantine was the first Christian Roman Emperor, so Proculus’ plan (let’s pretend for a moment Propositum’s story is true) about 250 years to complete. It took Islam only 100 years to take firm root throughout Arabia. 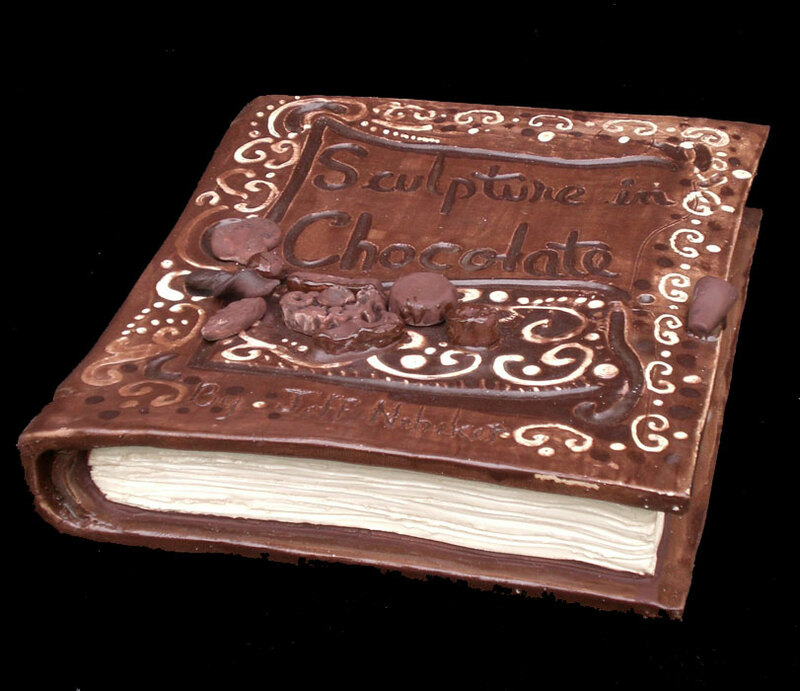 This would add more pages to this lovely book. Add to that the “shows” mentioned earlier and Propositum could clock in at 400 to 500 pages instead of 270. Fine by me. The author may groan, though! The book should get as much attention as Dan Brown’s DaVinci Code. Even more so. There should be publicity galore for this book and the subject getting the attention it deserves. There is no subject so controversial it should not be discussed. So-called Christians should be damning Sean to hell and in the very next breath saying they will pray for his soul. All while burning the book. Christians whose faith is strong will not have that faith shaken by reading Propositum, and they will get to read a good “what if” historical novel, get a scholarly feel for what life was like in the middle and near east two millennia ago, and – if they choose to ignore the basic premise of the book – get a realistic idea of what the early church must have been like. Premise or not, Paul and the earliest Christians probably went through exactly what is told (not always shown) by the author: hostile crowds, argumentative authorities and occasionally a convert. I bought my copy through Apple’s I-Store. It was my first fiction novel e-book. It is available in paperback and hardback directly from the author’s website and Amazon. Buy it, read it, enjoy it, discuss it. The author promises a sequel this year – with Curia and her by-now grown son at the helm of a new religion. An aging Proculus will undoubted have something to say! I can’t wait to read it!